In recent years the automotive landscape has been steadily shifting away from reliance on gasoline and diesel fuels. Nearly every manufacturer has an electric or hybrid offering. Many believe the way forward is creating all-electric vehicles like the Chevrolet Volt. However; especially in the North American market, there is an ever present anxiety about driving range. The answer up to now has been Hybrid technology. Hybrids use a traditional gasoline engine to power a generator that charges a battery. The system can also provide power directly to the wheels, thus enhancing the driving range. These systems work well, but if we are ever going to end our reliance on fossil fuel and produce true zero emission vehicles, another solution is needed. Toyota and Hyundai are betting on Hydrogen Fuel Cell Technology. This technology has been around for decades but there was always a nagging doubt about the safety of transporting the highly combustible fuel in a passenger vehicle (think Hindenburg). Those fears have been met by the constantly evolving technological landscape, which can now offer storage tanks that are capable of withstanding collisions without rupture and the ensuing inferno. So how does the FCEV work? A FCEV (fuel cell electric vehicle) uses stored hydrogen gas and outside air that is drawn into the fuel cell stack to create a chemical reaction. This chemical reaction creates electrical current which is used to power electric motors. • Hydrogen is pumped through the flow plate into the cell. • The hydrogen reacts with the titanium anode. This results in the hydrogen molecule being split into positive hydrogen ions and negatively charged electrons. 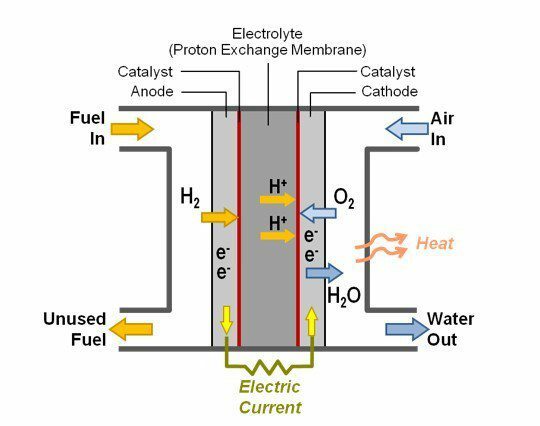 • The Polymer Electrolyte Membrane will only allow the positive hydrogen ions to pass which forces the negatively charged electrons to flow out through the anode. • The flowing electrons are sent along an external circuit which creates an electrical current. • On the other side of the cell oxygen from the outside air is pumped into the cell through a flow plate. • At this point at the cathode, another catalyst causes a reaction between the oxygen, hydrogen ions and electrons to create water, which exits the tailpipe. “Fuel cell vehicles have the potential to make a huge, positive impact on the environment and climate change,” said Eric Denhoff, President and CEO of the Canadian Hydrogen and Fuel Cell Association. This technology could really be the way forward. The vehicles operate in a familiar way and will offer all the comfort and convenience that customers have been accustomed to receiving. All that needs to happen now is a government and fuel industry commitment to providing infrastructure.